I really love things with personal touch. When I was designing my products I wanted you to have something unique…colors that will make you smile, that detail that will “catch your eye or even texture and the sound it makes when you touch it. For me, printed photos are the final and most important “link” in artists work. Especially in these “digital” times when we have all of our photos on computers and phones. So many couples told me that they have photos of their wedding somewhere on DVD or their computer, hidden and forgotten. Holding the photos in your hand is something that a screen can never fully replace. Trust me, when you see photos printed on 40 x 30 cm fine art paper, it’s something really special. That’s where albums come into the picture. The wedding books I offer are Fine Art Book, Retro Book, and Simple Book. 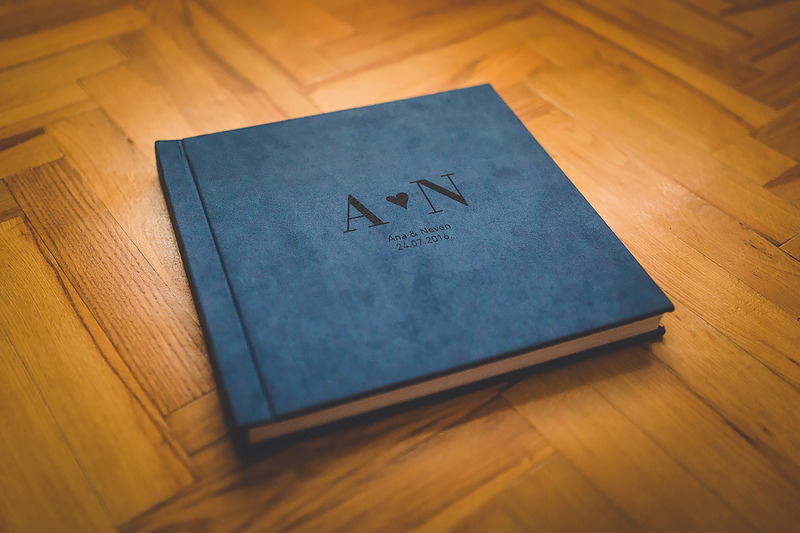 All albums are 30 x 30 cm, Lay flat with 25 pages ( 50 spreads ). You can choose between different colors, printed covers, laser engraving or embossing, boxes ect. Here is an example of Fine Art Book with Laser engraving. It is produced with soft look similar to the touch of peach peel. It is a set of an Album and Box. The Fine Art Book Cover can be Plain, in one of the 8 colors available, Laser Engraved or with embossing. The box can be made with White or Wengué Wood. For more info about the wedding books, please contact me via E-mail. The beautiful custom made box comes with USB and 100 ( 10 x 15 ) photos. The box is perfect because you can give or share printed photos with your parents and friends or frame them. The box and USB are made form wood and have engraved names of wedding couples. There is a smaller version of the box with USB and without printed photos. For more info about the packaging please contact me via E-mail. sviđaju nam se vaše fotografije pa bismo voljeli da nam pošaljete neke pakete i cjenik. Vjenčanje je u Pagu, 09.09.2017., nadam se da ste slobodni. Sara Surjan - Poštovani, zanima me fotografirate li krštenja i ako da, kolika je cijena po satu?